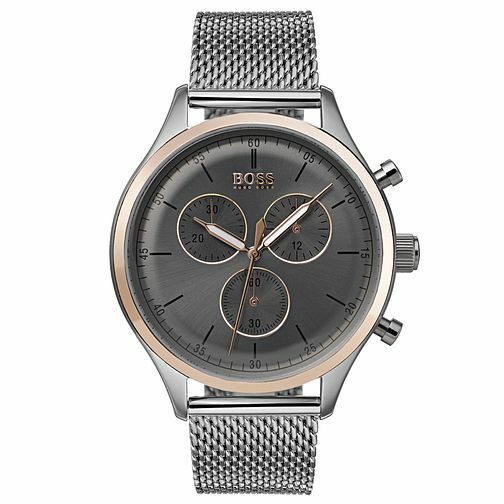 Hugo Boss crafts a modern piece that takes inspiration from industrial styles with rounded numbers that are marked in five second increments and three separate subdials that help you track subdivisions of time. The bezel features a rounded accent of rose gold plating that gives a careful and understated embellishment to the piece. Hugo Boss Companion Men's Two Colour Chronograph Watch is rated 5.0 out of 5 by 1. Rated 5 out of 5 by Anonymous from Very classy! I am in love with this watch and gifted it to my partner for our upcoming wedding. It is very stylish, well made and elegant.